“I much prefer to consciously work on myself by choosing to do the practices that help transform my mind. Getting tossed about by outer situations and people is a much harder and more painful process,” writes Vidyadevi in Instant Enlightenment, our December Contemplation Article. I agree! I am so grateful to Swamiji and the Svaroopa® Sciences for the practices that yield this kind of transformation. I have not forgotten what it used to be like, being constantly dragged around by my emotions, wading through the quagmire that was my mind. It is not that I am no longer affected or have no feelings about the things that happen in my life. I even feel my emotions more fully now. It is just that they no longer define me. My thoughts and emotions are not who I am. I am not enlightened – yet. Still, there is an ever-growing freedom and peace from the inner turmoil that comes from life’s curve balls. Phew, thank goodness! I would even go so far as to say bliss is to be found in life’s curve balls. When I really just sit with the issue in hand and see it all as Consciousness at play, even when it is painful, bliss arises. The Self arises within me; peace and clarity ensue. What better way to tackle a challenging situation? There might have been a time when I wanted to “escape the rock tumbler of life.” Not any longer. Bring it on I say, I’m ready! This entry was posted in Ashram News on December 27, 2018 by Svaroopa Vidya Ashram. As important as they are, you don’t get to choose your relatives. Yet you have made a great choice in being a member of the Svaroopa® yoga and meditation family! Today, I was honored to be calling yogis to thank them for Making a Promise to support their yoga and their Ashram. It was so sweet to hear their reasons for choosing to do so. They also described what Svaroopa® yoga and meditation does for them. They were overflowing with love and gratitude for the changes in their lives and for the love and support they feel being part of this amazing family. And you have seen that, when your life changes because of your yoga practices, you are not the only one affected. Your relationships with your family, your friends and even strangers shift their lives. I wish that I and the other Board Members could call each and every one of you, but that’s not possible. So many have been touched by the Svaroopa® Sciences! I also spent time calling yogis we haven’t seen for a while. I thanked them as well, and reminded them that they always have the Ashram as a pillar of support to rely on. There is nothing like it. Again, it was so sweet to hear what is going on for them, and how their yoga is making changes for their students and their families. This is a grassroots transformation. It is due to yogis like you who are making the world a better place by how you live. It is a wonderful life because you make it so. Your pledges to make or increase monthly donations along with year-end gifts supported us in reaching our goal: $30,000. Your generosity touches my heart deeply. On behalf of Sadguru Swami Nirmalananda Saraswati, your dedicated Board of Directors and I thank you for Making a Promise. This campaign is complete and we are very grateful to all who have given so generously. If you were not able to participate until now, you can still conveniently set up a monthly gift, increase your current monthly donation amount, or make a one-time donation by clicking here. This entry was posted in Ashram News on December 18, 2018 by Svaroopa Vidya Ashram. Ardha Chandrasana at the Wall became my favorite pose at the 2018 New Year’s Retreat in Atlanta. It was part of a short, sweet and deeply effective asana sequence. Swami Nirmalananda had created it, and I was privileged to teach it. I loved seeing yogis evolve in their approach and ability to work through all poses. One pose was blissful, another was energetic, another was more difficult and yet so transformative. All were beautiful pieces of the whole. Yet Ardha Chandrasana at the Wall clearly moved the group through the challenges, changes and contemplation that accompany New Year’s resolutions. Its benefits, besides opening the rib cage,include improvement to shoulders, neck and breathing. It also lengthens abdominal muscles and helps to prepare for meditation. Our group went into Ardha Chandrasana at the Wall after deep spinal release through tailbone, sacrum and waist area. At first, several yogis had difficult extending their arm close to their ear, then over their head and all the way to the wall. Even more difficult was pressing both hands into the wall to arc their torso and create movement in their spine. Then after several repetitions,and some assistance, most difficulty was gone. Repeating the whole lesson plan several times daily, they integrated the Ardha Chandrasana alignment details. With more flexible torsos, the yogis could reach the wall with both hands. They had more arc and movement in their spines. They could actually soften into the pose and use the strength of their arms to move them in deeper. We love poses that are immediately blissful. The purpose of Svaroopa® yoga, however, is to expand your inner bliss, both to dive inside as well as to take your bliss into the world. This means using your abs, legs and arms to support your spine, even to release your spinal tensions. This gives you the experience of your Self. From this inner depth, you live your life fully, joyfully. Our New Year’s sequence ended in a seated pose, to integrate and absorb the changes. Sitting allowed contemplation of where we were and where we were going. What a way to start a New Year! This entry was posted in Ashram News on December 11, 2018 by Svaroopa Vidya Ashram. Twice yearly, I reach out to you to ask for a contribution. Your donation supports the many needs of your nonprofit yoga organization. It supports the profound work of our founder and spiritual head, Sadguru Swami Nirmalananda. 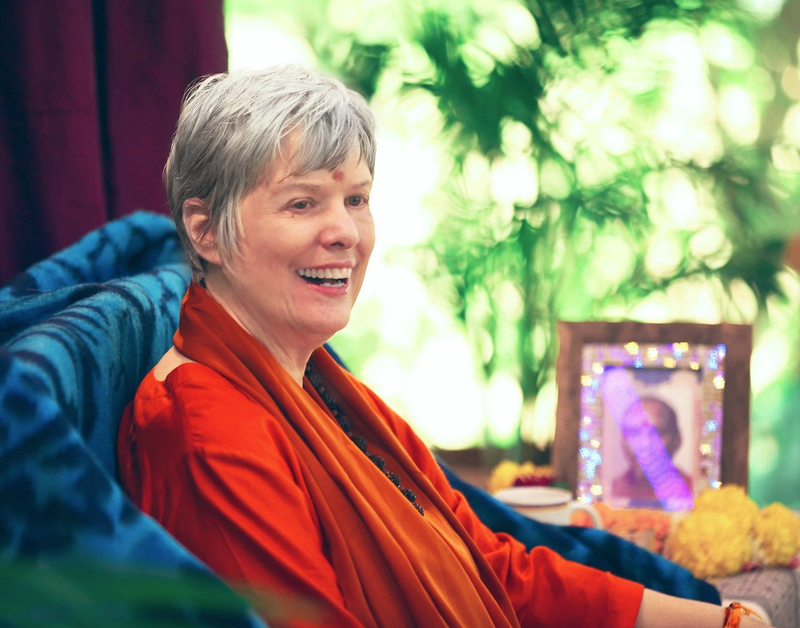 Our modern-day sage, our Guru, does not take any payment for her teachings. While you pay fees to take courses with Swami Nirmalananda, these monies go directly to support the organization. She is not compensated for her teaching time or the background support she provides. Our fees apply only toward the costs of offering the courses and other services we provide. Our course and program fees unfortunately do not cover the costs of supporting the Ashram’s whole infrastructure. This essential substructure enables dissemination of our Guru’s free teachings to you and seekers everywhere. Physical buildings need improvements and maintenance. We pay property taxes, insurance, utilities, faculty and the support staff that are needed to run programs. Many of you make a monthly donation. In making his pledge, you make a solemn promise. It is a commitment, a sweet promise that you uphold month-by-month. Your monthly gifts allow the Ashram to budget confidently, providing security for our organization. We are grateful to you beyond measure. Providing important support for Swamiji’s work in the world, your monthly gift gives even more. You ensure the continued stream of teachings from Swamiji. You provide her with the faculty, staff, supplies and facility that make her service to the community possible. Through these conduits, her Grace is unwaveringly available to you, to your whole Svaroopa® community and to seekers beyond. Guru’s Grace empowers you to do more and to be more than you think you are. Consider seeing your monthly pledge as a necessity, not as an extra. Reflect on the ways that your yoga deepens your inner experience. Remember the Ashram programs, retreats and courses that have opened you to ease and peace within, freeing your mind from need, greed and fear. What is more important than your progress on your yogic/spiritual path? Is it worth $25, $50, $100 or more a month? You decide. Whether your response is a new pledge, to increase you current pledge or to offer a one-time donation, give from your heart. Give because it fills you up from the inside out. Give and be filled with the Grace of our yogic tradition. In this season of gratitude and Grace, you can have it all, because you ARE all of THAT. This entry was posted in Ashram News on December 6, 2018 by Svaroopa Vidya Ashram. Looking back, Soraya says, “At the Conference, I felt that each and everyone one of us participating was 100% present — ‘there’. I was drinking in every moment, and I could tell that was true for everyone. Our time with Swamiji, in her Keynote Address and Satsangs, was beautiful. Her presence with us wove an extended, joyful intimacy among us San Diegans and all who came from across the US and Australia. Personally, I remember the power of a profound deep vichara (self-guided inquiry) led by Vidyadevi Stillman. This entry was posted in Ashram News on December 4, 2018 by Svaroopa Vidya Ashram.